It’s not photogenic but it sure was tasty. As I’ve mentioned in another post, it’s called “heritage pork” because many old hog breeds are becoming very rare. Heritage pork farmers often work on small farms. In doing so, they try to save these breeds from extinction while at the same time, give consumers access to more flavorful meat. Factory-raised pigs have been bred to produce very lean meat — so lean that the end product can be dry and bland when cooked. Heritage breeds often have more fat which makes the meat flavorful and moist. In addition, these pigs aren’t raised in confinement. The end results are happier, healthier livestock and less environmental contamination. In New York City, heritage pork can be purchased by visiting either Union Square Greenmarket in Manhattan or Grand Army Plaza Greenmarket in Brooklyn and stopping by Flying Pigs Farm‘s stall. If you reside outside NYC, I’ve heard that Preferred Meats is a quality purveyor. But this post isn’t about the sausage. No, what I really want to talk about is the Swiss chard and potato hash. I’ve lamented that people usually don’t treat potatoes as a vegetable, instead seeing it as a starch. I feel that this is limiting, and that if you take this new approach, it opens up meal possibilities that you might not necessarily have thought of before. Although the pic shows Swiss chard, the hash works well with lamb’s quarters, collard greens, turnip greens, spinach or even kale. Cook peeled potatoes and greens separately in salted boiling water until tender. When done, drain and coarsely chop. In the case of the greens, be sure to squeeze out as much water as possible. Set aside. Heat some olive oil in a large skillet. Add chopped garlic and a pinch of red pepper flakes. Alternately, add a pinch of Aleppo pepper or a crushed ancho chile. Stir. Once the garlic takes on a little color, add the potatoes and greens. Mash the potatoes with the back of a wooden spoon. Cook for about three to four minutes. Check for salt, although you shouldn’t really need too much. Remove from heat and serve immediately. Drizzle some extra-virgin olive oil atop each serving. PS. 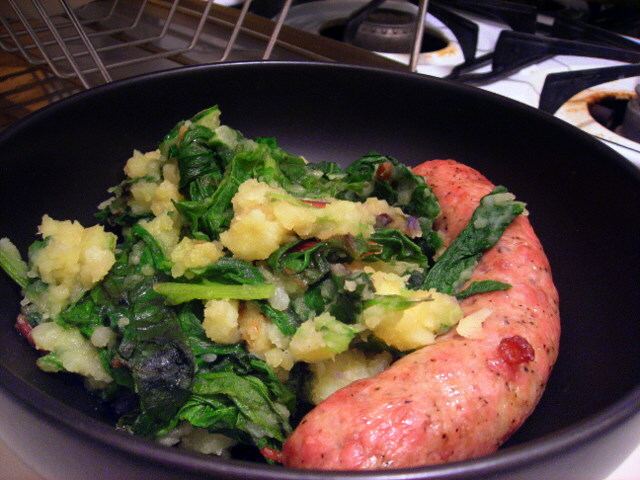 The chard and potato hash is vegan. 09 Jun	This entry was published on June 9, 2009 at 12:48 pm. It’s filed under food, general, vegan, vegetarian and tagged dinner, greens, heritage pork, potatoes, slow food, Swiss chard, vegetables, vegetarian. Bookmark the permalink. Follow any comments here with the RSS feed for this post.